The Embassy label occupied a unique niche in the UK record business during the late 1950 and early ‘60s as the label on which budget-priced cover versions of current chart hits were released for exclusive sale in Woolworth’s stores, and it was massively successful, to the extent that the label retains an army of fans half a century later. Using orchestras, choruses and soloists drawn from the ranks of the best session and concert performers of their day, the label also recorded a succession of EPs and then LPs covering many forms of popular music, notably that of music from stage and screen, and this collection is devoted to part of that output. 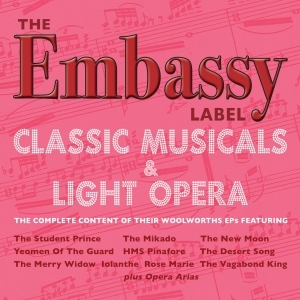 It brings together the tracks from the Embassy EPs which featured highlights of the era of operetta-style musicals by celebrated composers along with the renowned Gilbert & Sullivan comic operas. Included are highlights from ‘The Merry Widow’ by Franz Lehar, ‘The Student Prince’ by Sigmund Romberg and Dorothy Donnelly’ ‘The Desert Song’ and ‘The New Moon’ by Sigmund Romberg and Oscar Hammerstein, ‘Rosemarie’ by Rudolf Friml, Herbert Stothart and Otto Harbach, and ‘The Vagabond King’ by Rudolf Friml, along with Gilbert & Sullivan’s ‘The Mikado’, Iolanthe’, HMS Pinafore’ and ‘Yeoemn Of The Guard’’ plus the bonus of some operatic arias. Once again it’s an evocative and entertaining selection of perennially popular material. It will undoubtedly appeal to Embassy label enthusiasts and collectors, but is also an excellent collection for those looking for an entertaining selection of recordings from this genre.